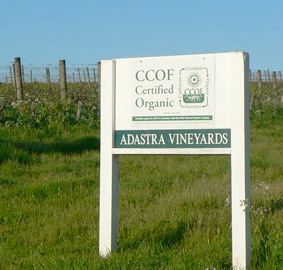 Adastra vineyard is a California Certified Organic vineyard situated in the very heart of the Los Carneros appellation. Located in a low spot with cool air flow and relatively light clay-loam soils, it is a site with naturally low vigor. The inherently low yields produce extraordinary fruit from vines that require little manipulation, one of the hallmarks of an exceptional vineyard. Having worked with these grapes while making wine for another winery, we were thrilled when owner Chris Thorpe offered this fruit to Talisman. Twenty acres of the 33 acre ranch that Chris purchased in 1984 from the cattle ranching Sandback family are dedicated to grapes. Half the vineyard is planted to Pinot Noir, with the remainder Chardonnay, Merlot and Syrah. The use of cover crops for soil nutrition and bird boxes to attract owls, kestrels, bluebirds, tree swallows, and even bats for pest control, are two of the techniques that demonstrate their holistic approach to organic farming. Talisman began bottling the vineyard designated Adastra Vineyard Pinot Noir with the 2005 vintage. These wines are typically rich, lush, seemless & elegant and offer the classic Carneros Burgundian characteristics, but with added grace and Talisman’s signature silky texture. Chris and son-in-law Edwin Richards, who manages the vineyard, also make wine under their Adastra label. The name Adastra is taken from the Latin saying per aspera ad astra, meaning “through striving to the stars."